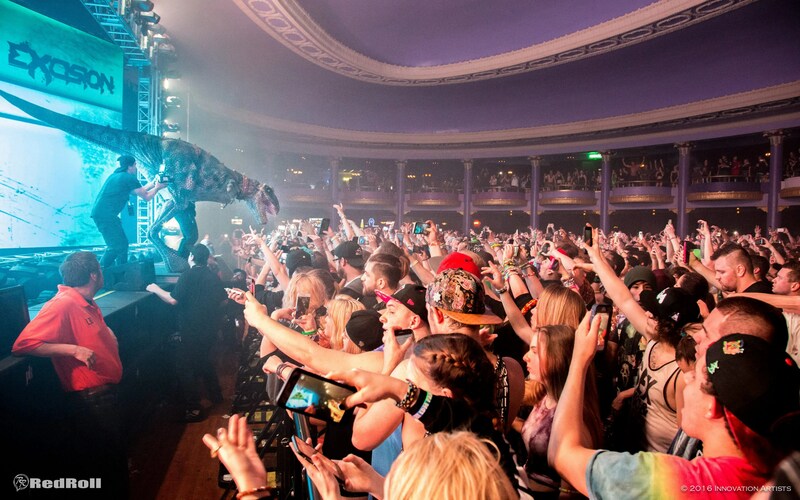 (Milwaukee, WI) – The Rave in Milwaukee showcased back to back nights of bear costumes, robo kittens, and head banging dubstep on March 18th & 19th with Excision, Figure, and Bear Grillz. The two-day stop was not initially announced as a stop on the Paradox tour’s original 40 dates but it didn’t stop Jeff Abel aka Excision from bringing 150,000 watts of bass and one of the most impressive productions since Skrillex’s space ship to Wisconsin. Jeff Abel became known as Excision in 2004 and since he has been building an head banging dubstep empire with collaborations with fellow Canadians Datsik and Downlink. He is also a member of the robotic dubstep band Destroid, but he stripped himself of the alien suit for a different visual showcase with the Paradox stage at The Rave. The third revamp to Excisions already impressive stage productions wowed the crowd with over 50 moving spotlights, color changing light bars, and an adapting LED stage setup. Abel felt the move to the updated Paradox stage was necessary for the visual production to keep up with his music. The same core team that was responsible for the “X Tour” and the “Executioner” swapped out visually mapped aesthetics for a modular LED based system that allows the stage to adapt to smaller venues so more Excision fans will get the full X-perience. The massive visual experience takes three full semis to transport in what Abel referred to as a creative decision rather than a business one. The decision shows his dedication as an artist and that is reflected in his music. The Paradox does a great job of consistently touching its “X” theme with crossing lights mixed with LED visual experiences of shifting robotics, African safaris and intense infernos. Fans had The Rave hot and humid as Excision dropped a truly unique experience with one wub after another. The electrifying visual experience only intensified the bass heavy head bangers making for a sweaty night for everyone, but staff did their best to hydrate the crowd with by passing out water bottles and occasional spraying mist into their faces. To say the sense of community and love flowed freely throughout the night is no exaggeration. During Excision’s set, fans banded together to lift a man in a wheelchair high above the crowd so he could see the massive stage setup and crowd surf. There are still four more dates on the Paradox tour including stops in Wichita, Kansas City, St. Louis, and Denver. View the full photo album shot by Steven Koch of Innovation Artists below, or on the Innovation Artists Facebook Page.